It was a bit of a drive from Monte Vista, but like I said, you have to stay at the Movie Manor at least once in your life. It was much less windy compared to the day before, but there was still a little breeze. 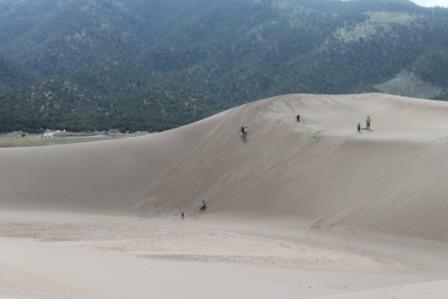 We were also a little more prepared today, and had debated on which shoes were best for the dunes, especially since you start out hiking across the very wide Medano Creek. We thought about wearing jeans, but decided that since we would be hiking, we would warm up and want our shorts. Ken wore his hiking tennis shoes, and I wore my generic Crocs. I am not sure it matters what kind of shoe you wear, you are going to get them full of sand. Neither one of us wore socks. And off we went, up the dunes. The highest one is 700 feet, high, which doesn’t sound like much, but look at those people up there who look like ants. 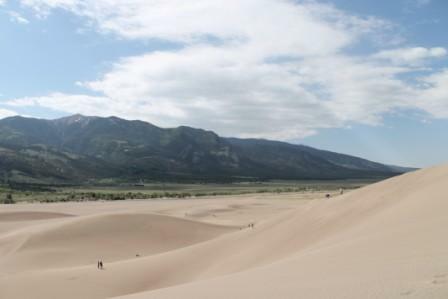 Plus you are at altitude already, about 8,000 feet, plus you are walking in SAND, and the surface is up and down and up and down and up and down. Little kids, dogs, and people who are really in shape seemed to do really well on them. So that would cause him to pause and pose for a picture, which I exacerbated even more by having difficulties with the display on my camera and fiddling with that endlessly. I finally got that figured out on top of one of the dunes. When we felt that we had climbed to a reasonable height, and had taken enough pictures, we hiked along one of the long ridges to head back a slightly different way than we had come up. And I discovered another phobia spot – back when were were in San Francisco on the cliffs above the ocean, I wasn’t really wild about getting too close to the edge of the cliff. 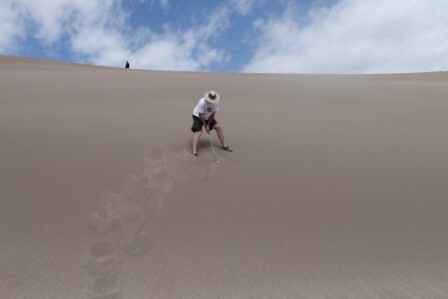 Well, I wasn’t really wild about walking along this really narrow ridge at the top of this tall, steep dune, either. Being in tall buildings doesn’t bother me, it must just be certain heights in nature. So I didn’t want to dilly dally around there. 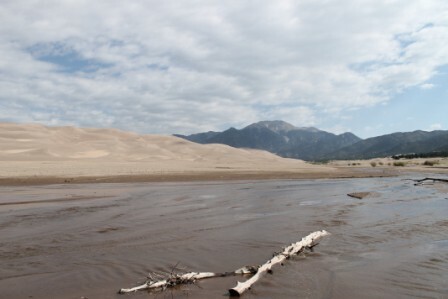 See that dune the people are walking on, high in the picture? Really narrow and steep at the top. Looking back toward Medano Creek and the visitor’s center and parking area. We had both slapped on sunscreen but I still managed to get more color than I wanted on my nose and cheeks. 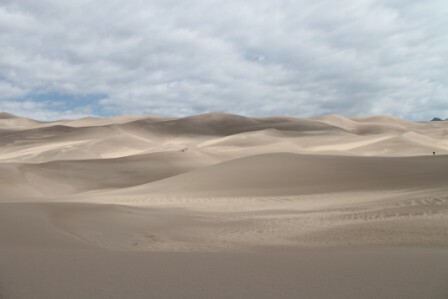 We headed out from the Sand Dunes, stopping to take a few more pictures in the distance, and debated what to do for lunch. It was about 3 hours to Santa Fe, and it was about 11 when we left. Neither of us was hungry yet, so we by-passed Alamosa and headed south toward New Mexico. It doesn’t take long once you are past Alamosa to be in New Mexico. 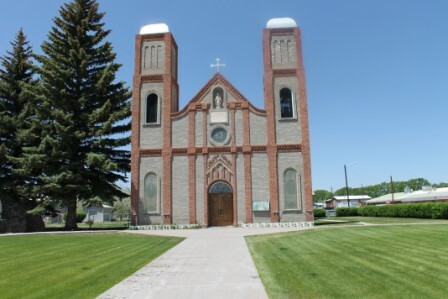 I had taken over driving because Ken needed a nap, but of course he was foolish enough to point out a roadside sign for “Oldest Church in Colorado” and I had to slam on the brakes (well, not quite, but decelerate quickly) and drive the 1/4 mile to take pictures. 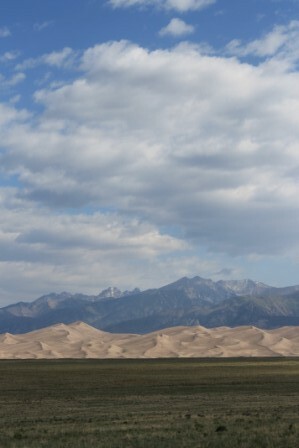 And then we were in a lunch desert. Ken napped, and I drove and searched for radio stations as we moved through northern New Mexico. 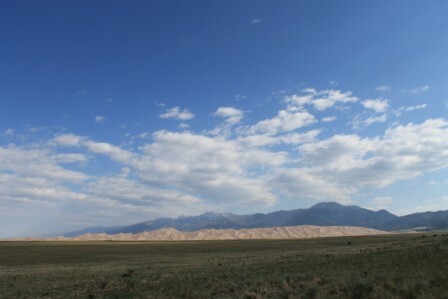 The scenery turned from dry, desert flatlands to hilly National Forest with trees and interesting rocks. We were just about starving when we came upon the town of Ojo Caliente, (which means hot eye in Spanish, I am sure there is an interesting story there) (Ken says someone was cutting up chile peppers and then touched their eye). There were not one, but two cafes, and I, of course, chose the one that looked like it had the most character. Of course, it also had A CHARACTER in it. Apparently the gentleman who owns the store next door feels free to sit in the cafe (maybe only while he is having lunch) and chat up the patrons. Ken whispers to me: “We are not going in his store, he will talk our ear off.” I can’t remember what the name of the cafe was, and we paid with cash, so no receipt. I had the Tewa taco, which is what we would call an Indian Taco in SD. 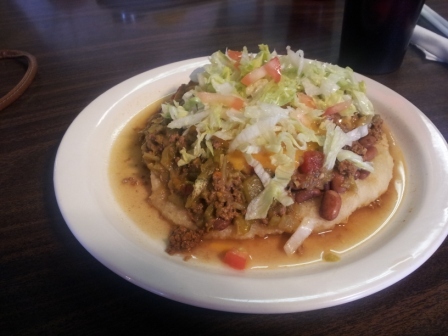 It was fry bread or sopapilla with taco meat, pinto peans, lettuce, cheese, tomato and green chile on it. 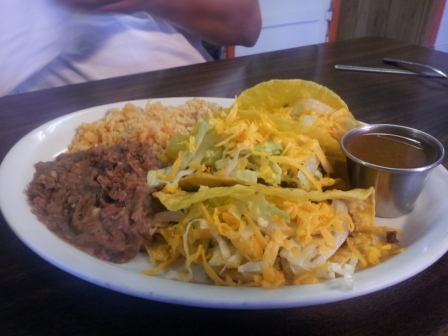 Ken had the hardshell tacos, he said they were good. Ken also pointed out to me they had an old-fashioned Sno Cone machine, so you know I was going to have one of those (Sno Cones are few and far between, especially ones made with the old school machine.) And with that, we were back on the road again, trying to find a radio station that would stay with us for a few miles. We drove by Espanole, which is where Ken was planning on golfing on Friday. That was something we started to recondsider when we got to our hotel and discovered it was a good hour from the hotel to that golf course, because I wanted to do things while he was golfing, and I didn’t want to drive to Espanola, drive an hour back to Santa Fe, then drive an hour back to Espanole, etc. And he didn’t really want to go to the yarn store and the Georgia O’Keefe museum with me, but he did want to see the Loretto Chapel and the Basilica and have some time for shopping in the Plaza area. 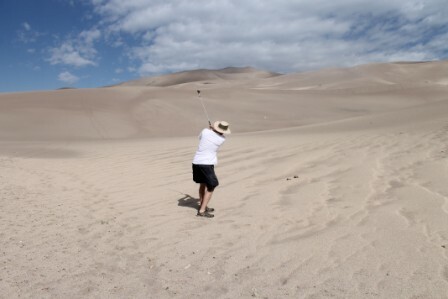 So we compromised and decided he would try to find a decent golf course closer to Santa Fe. 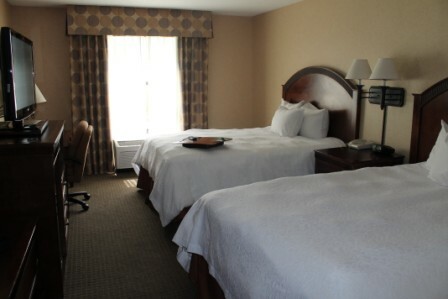 We are staying at the Hampton Inn in Santa Fe, I had some points that I could use for one of the nights. It is fine, the bed is firmer than the one in Monte Vista. It is just quite a distance from downtown, but nothing too bad. We got checked into the hotel and went down to the Plaza area of old downtown to wander around. We checked in at The Shed, the restaurant I had investigated, and they had a 45-minute wait, so we put our names on the list and went to look around for 1/2 hour. We checked out a few gift shops, made mental notes for what we would get tomorrow if we didn’t find anything we liked better, and walked by the Santa Fe Basilica. A huge line of people was waiting to get in, apparently there was a symphony concert that evening. We returned to the restaurant and got our buzzer, which went off in about 10 minutes. The Shed is in an old downtown adobe building, and it is like a maze with extremely low doorways. The hostess said the doorways were short partly because people were shorter then, but also because it helped with insulation (??) (I would think it would make the walls more stable too), and it prevented people on horseback from riding into the building, when they were attacking during the early, unsettled days. 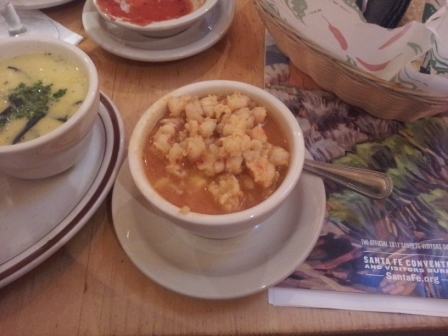 We had New Mexican for lunch, so I was looking for something slightly different, and I had seen the soups on the menu, and that was what I had in mind. 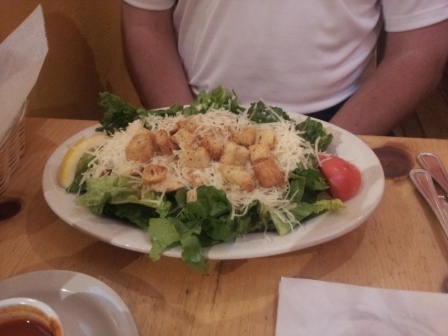 Ken decided the adobo-marinated chicken would be too spicy for him, so he had the chicken ceasar salad, which he said was quite lemony but good. We also had an order of the chips and salsa, the chips were much fresher than the ones the previous evening, and the salsa was excellent. I asked for a small cup of their red chile sauce, just to try. I think I like red chile better as an ingredient than as a straight sauce. I had the St. – something margarita, which had elderberry liqueur in it and should have come with a warning label – wow! Strong! 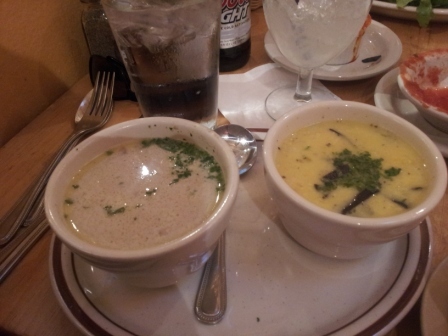 And then I had three different soups – the mushroom, which had blended mushrooms in the broth, the posole, and the corn chowder which had roast chicken, green chile, corn, carrots topped with blue corn tortilla strips. They were all good, but the mushroom was the best. I am going to have to try making something like that. And then since I only had soup for dinner, I had dessert (Ken didn’t see anything he was interested in). 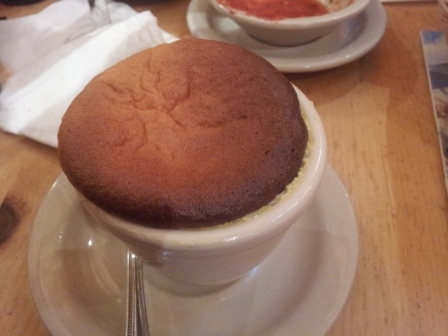 I had the lemon souffle, which also was excellent, very light and refreshing. And then we came back to the hotel, and I worked on my blog from the day before, and we crashed. We watched the local news, and found out that it is a good thing Ken is golfing on Sunday in Albuquerque, because they are going to have 50 mph wind on Saturday, so that should be fun. The news also said there would be more smoke the next day from fires burning to the west. 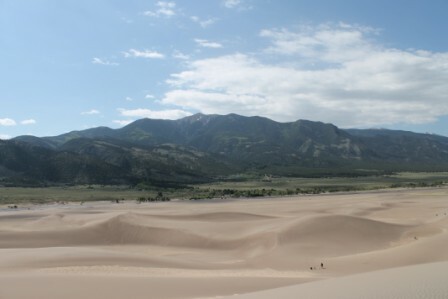 This entry was posted in Colorful Colorado, Great Sand Dunes Trip Report, Restaurant reviews, Santa Fe Trip Report, Travel and tagged Food, New Mexico, restaurant reviews, travel by glenderella. Bookmark the permalink. You drove through Espanola and didn’t stop at the fiber arts guild?! 😦 One of my favorite yarn stores.